Independent cinema in Korea has been gaining a lot of steam over the last few years, and now, as filmmakers become bolder or seek to distinguish themselves from the pack, stories are becoming more ambitious and the technical tools used to tell them more sophisticated. Case in point is A Fish, an elliptical shaman mystery shot in 3D. Unlike what we’ve come to expect from the format, this is a far cry from big-budget spectacle. It’s a slow art film with a metaphorical and sometimes impenetrable narrative. 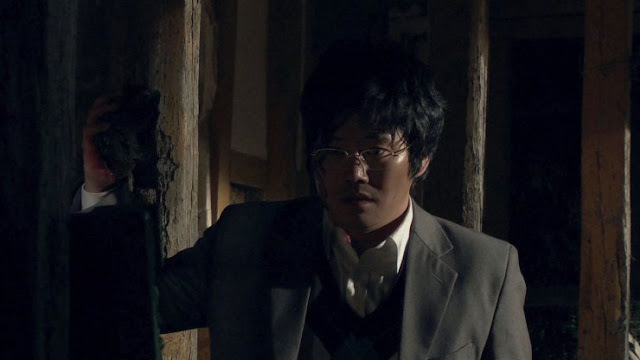 A bold and ambitious debut, Park Hong-min’s A Fish is a challenging work that is certain to infuriate just as many viewers as it may enchant. I won’t pretend to have understood it particularly well, but I can say that I was swept up in the strange world it conjured up on a remote Korean island, full of intrigue, spirituality and unanswered questions. Many times I found myself drawing comparisons to David Lynch, whose dream-like narratives have long fascinated and delighted me. But Park’s film is no mere copy: it is a singular work from an exciting new talent in the field. A professor abruptly leaves class one day to embark on a journey with a slightly deranged private eye. Their mission is to find his wife, who has left for a remote island to become a shaman. Meanwhile, two fishermen enjoy some philosophical bantering while out night fishing but later realize they don’t know how they got there in the first place. As its title hints at, Park’s film uses fish as an allegory. The fishermen ponder why their prey rise to catch bait from a food group that is not generally a part of their diets. Each and every one of us is represented in these fish, as we grapple with our lifelong existential plights. With a great deal of philosophical meanderings and narrative question marks, A Fish can make for a baffling viewing experience. However, it has atmosphere in spades and as the mystery unfolds, posing far more questions than it ever attempts to answer, it is frequently engaging. Though I didn’t understand that was happening on screen, particularly near the end when the very identity and existence of the main protagonists is thrown into considerable doubt, I had a great time nonetheless. 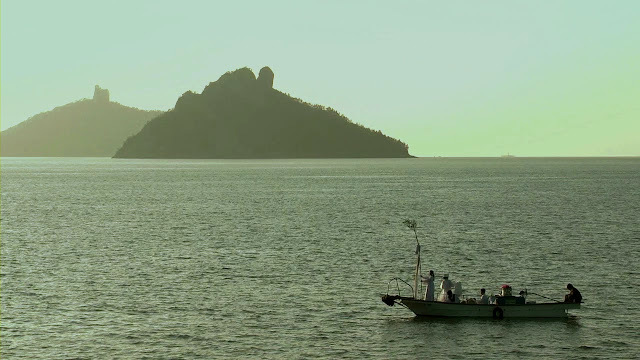 Set away from the hubbub of contemporary society, Park’s film features an increasing amount of water as the characters migrate to an island and eventually find themselves on boats: at night, during the day or for shamanistic rituals. Reminiscent of shamanistic island dramas such as Kim Ki-young’s Iodo (1977) and Im Kwon-taek’s The Divine Bow (1979), the mystical and life-giving power of water adds to the film’s calm yet unsettling aesthetic. The film features a series of images and metaphors that develop as the professor continues his journey. A thick, obfuscating fog follows him through much of his journey, representing his confusion which mirrors our own. Later, the crystal-clear sea refracts the sunlight, brilliant and disorienting, which beats down from overhead. Finally, the production design of the latter stages becomes littered with mirrors. These looking glasses tease us with the hope of clarity and understanding but their visions only further our bewilderment. Sadly I didn’t have a chance to see the film in 3D and as such cannot say if the medium elevated or detracted from the experience. Though from what I’ve heard from other people, it seems that it may well have been the former. Many have been and many more are likely to be frustrated by this elliptical debut but it is not one to be idly cast aside. As our hero (whether he is real or not) finds himself staring at his own reflection, you too may find yourself in a similar predicament. It's been more than I year that I watched this and I really want to see it again, because I think it's the sort of film you need to watch several times to at least somewhat understand it. What I do remember is the white clothing, which I'd interpret as symbolising death/mourning.